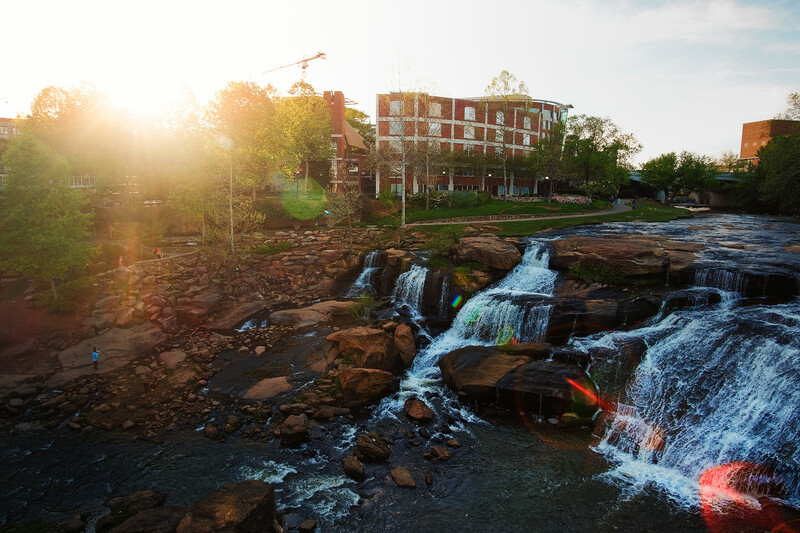 A southern city with a vibrant main street, lush rolling hills, river falls and the famed Swamp Rabbit Trail, there is so much to enjoy in Greenville. 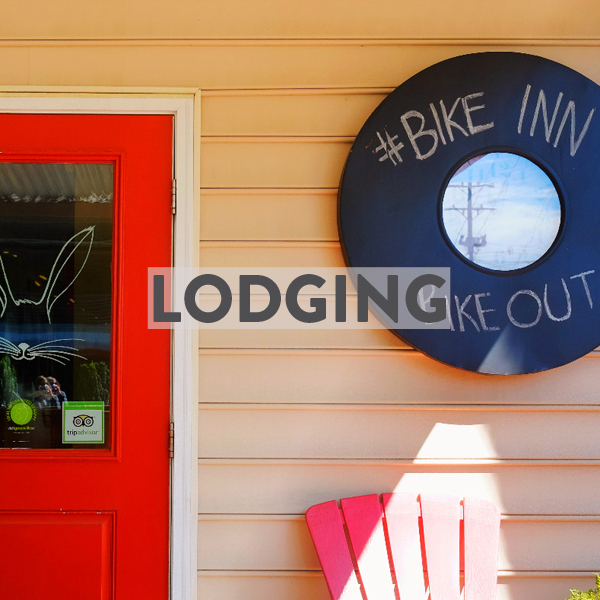 Bikabout's city guide has riding tips, routes curated by locals, and logistical resources you'll need to wander Greenville by bike. Walkscore: 41. Walkscore is a score out of 100 and is based on whether basic amenities like groceries and restaurants are within .25 miles. Modern day Greenville, located about halfway between Atlanta GA and Charlotte NC, was once prime Cherokee hunting grounds that were forbidden to white settlers. Eventually the inevitable happened, and the land was ceded to European settlers, who built plantations and a town. The picturesque locale sits on rolling foothills along the Reedy River, with mountains in the distance, and by the early 1800’s was already a popular vacation destination. Cheap labor, local cotton, and abundant water made the area a magnet for the textile industry, until the Great Depression laid waste to the economy. Emerging from World War Two, ever-cheaper labor overseas meant that the textiles never returned, but Greenville continued to prosper due to a combination of military investment and new universities. The 1970s hit Greenville hard, however, and the population declined for the first time in memory. Help arrived in the form of newly elected Mayor Max Heller, an Austrian-born Jew who narrowly escaped the Holocaust by emigrating to New York City. Mayor Heller cut Main Street down from a 4-lane speedway to a 2-lane, tree lined, café table encrusted affair modeled after the European cities he remembered from childhood. Had he not died in 2011, we’d buy him the largest stein of beer we could find to thank him. This newly beautified downtown is now flush with patrons who are largely employed at the massive new international automotive and industrial factories located just outside town, lured to South Carolina by massive tax breaks and (wait for it) cheap labor. 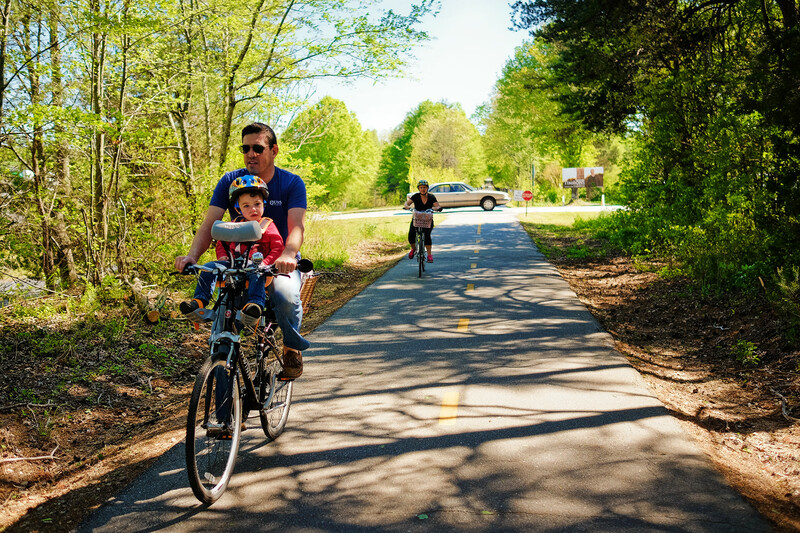 And so, in 2016, we find Greenville with a booming economy, a growing population, a gorgeous downtown, and now the incredible 20-mile long Swamp Rabbit rail trail that draws locals and tourists alike. Retired road racer extraordinaire George Hincapie is even a resident, and his branded cycle clothing is ever present. Around town, bike traffic is light and unstressed, with almost no one bothering to use (or really needing to use) hand signals. Cars are largely patient and friendly, and pedestrians seemed to be aware of their surroundings. On the Swamp Rabbit rail trail, there is a mix of roadies exercising at 20 mph and children toodling along on scooters at 0.5 mph. In both cases, you don’t really need to worry much about etiquette. Just remember to smile and say “hi” to everyone you pass and you’ll fit right in. A front white light is legally required, as is a red rear reflector and we could not find any helmet law. On some of the outlying roads, there was faster traffic (often of the gigantic diesel pickup variety), and no shoulder to speak of. Those roads are easily avoided, however, with some care and google mapping. Downtown roads were mostly well designed for humane speeds and clear sight lines. We found biking around town to be stress-free, safe, and easy. Greenville appears to have lower theft rates than average but still lock your bike up during the day and definitely u-lock it if leaving out overnight. The bike culture in Greenville seems pretty new. There is a well-developed road bike culture, with spandex and drop bars popping up regularly, but the transportation biking scene is less well established. Non-racing bikes are mostly a mix of fat tired cruisers, 3 speed city bikes, and repurposed mountain bikes. Bike shops we visited had a properly diverse and useful set of bikes for sale, hopefully setting the stage for more and more people opting to do normal daily things by bike. These routes were curated by local Greenville folk who wanted to share their #BestBikeRide with you. Print off the map for free! 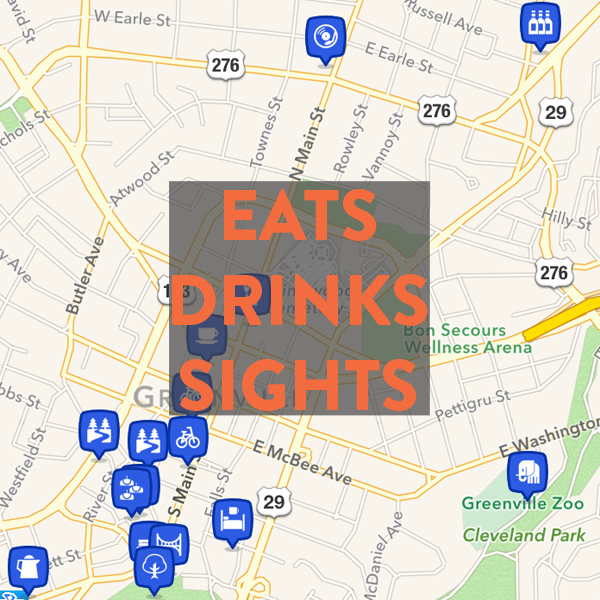 Live in Greenville and love food, music, art or just being outdoors? Curate a route for us by inquiring here. Greenville B-cycle (bike share)- $5 daily for sturdy city bike with front basket, lights, fully enclosed chain guard and skirt guard. We're constantly updating this list of our favorite local shops, restaurants, cafes, scenic vistas and other nooks and crannies in Greenville. GreenLink Transit (Map) - $1.50 one way. "All fixed route buses and downtown trolleys feature racks with two easy-to-load bicycle positions." Bikabout donates 25% of annual revenue to local advocates. You, too, can power better biking in Greenville by donating to Bike Walk Greenville!